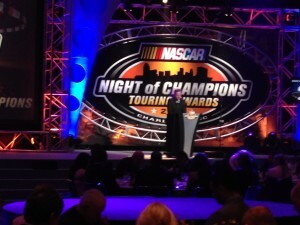 On Saturday evening, as I stood behind the podium awaiting my introduction prior to the invocation, I looked across the audience at NASCAR’s Night of Champions Touring Awards attempting to capture mental pictures in my mind as I had been doing all day long. NASCAR’s Night of Champions Touring Awards has always been a special experience for Michelle and I as we come together to celebrate the grit our teams exhibit throughout the year. Yet amidst the joy and celebration this year was a somber one for us. It symbolized the final page being turned in an amazing chapter in our lives. In those few fleeting seconds of silence at the podium, nine years of memories flooded me as I looked across the ballroom. Nine years of celebrations and struggles; experiences and relationships; highs and lows; they all washed over me knowing this was our last (at least in this capacity). I had to take pause to remember why. The past 11 years of our ministry experiences can be traced back to a specific moment in 2002 as I sat on the old metal benches at Nashville Fairgrounds Speedway. It was sitting in those grandstands watching cars circle the track that I had a very real conversation with God; a conversation that would continue to direct our family 11 years later. It was that conversation with God that led Michelle and I to walk through the back tunnel at Nashville Fairgrounds Speedway as newlyweds in 2004; to spend time with some dear people who we are still friends with to this day. That same conversation with God then led Michelle and I to walk into Caraway Speedway in 2006, beginning an amazing 9-year adventure with the NASCAR Whelen Southern Modified Tour Community. And that very conversation with God is what led me to the emotions of this weekend, saying ‘so long for now’ to the community we’ve been a part of for 9 years; leading us to pull through the tunnel at Daytona International Speedway and say hello to a new racing community. As I sat in those grandstands in 2002 God’s words were so clear; it was as real and audible to me as it is when you great me hello. God’s words were simple, yet profound, directing me to use a passion of mine as a ministry platform. As God was speaking, I interrupted Him, and decided that God was calling me to be a racer. I chose to stop listening and start planning on my own. That decision led me to an extreme low with a lot of heartache along the way (that is another story for another time). It was at the bottom that I began to understand that what we do isn’t about what we want, it is about how He has purposed us. In that moment, I made the decision to be obedient. I made the decision to follow God when He leads. Whatever that looks like or wherever that takes us. Standing behind that podium, overwhelmed with emotion, I remembered why. Following Christ isn’t about us, it is about Him. If it were about me it would be “Leading Christ”, but that is not the case. To love God is to serve God. To serve God is to be obedient to God. 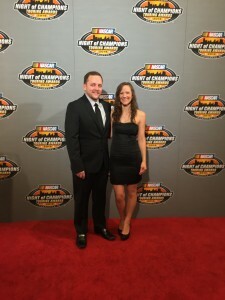 So the same reason I came to the NASCAR Whelen Southern Modified Tour in 2006 is the same reason we are leaving in 2015. 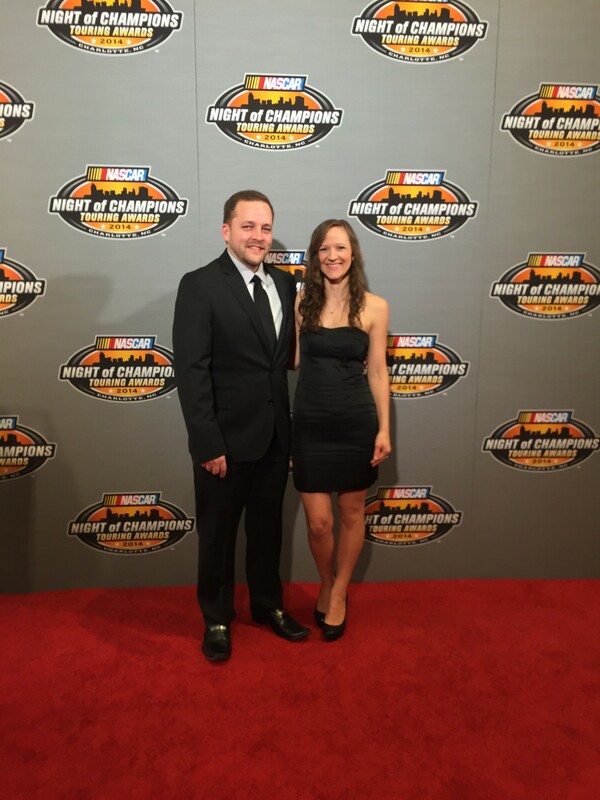 It is this same spirit of obedience that brings a new family to serve the NASCAR Modified community in 2015, a family that I know you will love and embrace. Our family journey is about Following Christ and making Him known, wherever that may lead us. That pursuit may not always lead you where you think, but it will always lead you right where you need to be; in the middle of God’s purpose for you. So with that, I leave you with this. I love you all dearly, truly more than I think any of you will ever know. Because of that love I have continually prayed that you would experience the love of God through our presence at the track in tangible ways. These past 9 years will have been years lost if I don’t invite you to follow Christ. For some of you, we’ve had the beautiful opportunity to have these conversations face-to-face. But for others, our conversations may have never journeyed there. I don’t invite you to follow Christ because the bible says I need to share this with you. I invite you to follow Christ because I have experienced Him. I’ve seen God evidenced all around, and He is good. I want you to experience what we have experienced. I want you to have the relationship we have. I want you to have the peace, hope and love that we receive. I want you to know who we know. I don’t want you to know Christ because you think it will take away the problems of life or because you are scared of hell…I want you to know Christ because His love for you is real. I want you to know Christ because of the peace, hope, forgiveness, purpose, grace and mercy you will receive. I want you to have a relationship with Christ because I have tasted it…and it is good. It is not a pill to fix this life, but a beacon to guide you through. Will you consider following Him with us?